Welcome home to the quiet side of Uptown living! This upgraded, spacious unitboasts brand new wall to wall bamboo flooring, fresh paint, AT&T Fiber just installed and more! You will lovethe quiet privacy of the balcony that overlooks the courtyard. 5th and Poplar is everything you need in onelocation. Gym, work space, event hall, courtyard, putting turf, pool, outdoor fire place, all nestled on the sameblock as Harris Teeter. 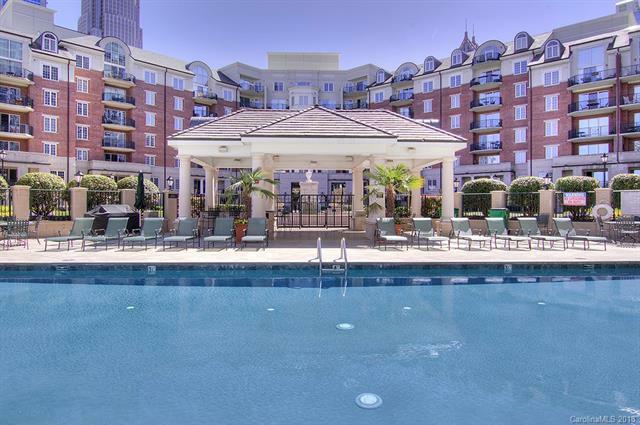 It's easy city living with Bank of America Stadium, Knights Stadium, parks andrestaurants all just steps outside your door. Come take a look at the over sized master and great flex space.Kitchen is finished with new pendant lighting, granite and stainless steel appliances. Because of itscorner/courtyard view location this patio is very private and very quiet with spectacular views. Unique floor plan with BONUS FLEX SPACE that could be utilized as a second bedroom!